Online Payment Gateway is used to make cashless online payment. There is no need of carrying money on pocket if we have the online payment gateway account and have balance added on it to pay internet bills, to recharge mobiles, to pay tv bills, to pay water bills, to pay electricity bills, to buy bus and flight tickets, to shopping online from Online Shopping sites and other more. An online Payment gateway is also known as the digital wallet, is the best system for financial traction through the internet. 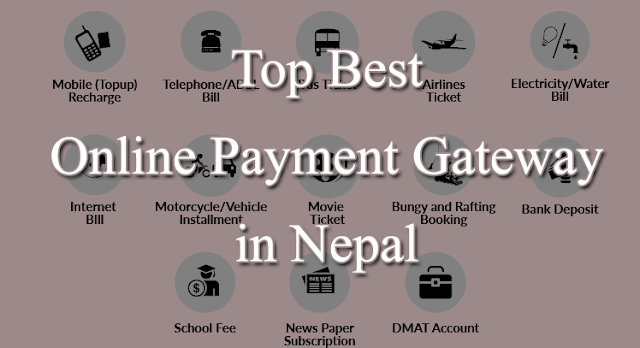 Here we listed Top Best Online Payment Gateway in Nepal. Now you have to decide that as listed below, which is best for you. eSewa Nepal is the first online payment system provider in Nepal. They are adding more services on payment gateway day by day. We can (with whom they collaborate) Shopping Online, pay internet and phone bills, pay water and electricity bills, pay schools and collages bills, mobile recharge, tv recharge, buy bus and flight tickets, send money, buy movies tickets, withdraw money to the bank account and more. They collaborate with almost all (44) banks of Nepal to add funds on eSewa account and withdraw eSewa balance from that partner banks (Small Charge Applied). We can add funds on eSewa payment system using mobile banking and internet banking of that partner banks. Esewa also provides the bonus on their some services like on mobile top-up, shopping online from their ePasal etc. Merchants get more bonus than an individual user on eSewa digital wallet. To use eSewa online payment system in Nepal, Sign up using their mobile app or website for free. To add funds on your eSewa account you have to go for bank deposit if you don't have mobile banking or internet banking of any their partner banks. Khalti is another online payment gateway in Nepal that developed and operate by Sparrow Pay Pvt Ltd. Khalti also has many services like Mobile Top-up, Pay internet, electricity, telephone, water bills, TV bills payment, flight ticketing, movie ticketing and more. Khalti is newer than eSewa and they are increasing their services rapidly. Khalti also provides the bonus for their customers on theirs some services. Till the date Khalti has not provided Khalti account to bank account withdraw service even they have that option there. There are limited banks to add funds on Khalti digital wallet. Khalti has KIOSKS TO WALLET service that means we can Load funds to Khalti from Kiosk Machines (Recharge Machines). We can add funds on Khalti using internet banking of their partner banks. Khalti Digital Wallet is free to register and use. Just download the mobile app or use their official site to sign up. iPay is another online payment gateway that provides online payment options. They serve customers to pay telephone bills, electricity bills, internet bills, mobile top-up and more. iPay is service of muncha.com an online shopping site. Currently, iPay has few banks to add funds and hope they will increase their services. We can register through the mobile app or through the website for an iPay account for free. The Internet has made life easier and faster with less effort. Online payment gateway makes payment system easier and cashless. These are Top Best Online Payment Gateway in Nepal that we noticed as their services, user-friendly app, and site development. If you know any another best online payment gateway that we missed, please let us know on the comment below. I have been using www.khalti.com for months now. I think it's UI/UX is what drew me to it.With more services being added, this a must have app.